Did you know that February is National Pet Dental Health Month? It’s just as important to care for our pet’s teeth as it is to care for your own. According to the American Veterinarian Dental Society more than 70% of cats and 80% of dogs will develop periodontal disease by the time they are three years old. Just like with humans, research shows that there is a connection between poor oral health and kidney, liver, lung, and heart diseases. Some signs of periodontal disease include but are not limited to red, swollen gums, bleeding gums, yellow-brown tartar deposits, and loss of appetite. If you’re seeing signs of periodontal disease in your pet, it’s time for a trip to see your vet. Did you know that a pet that has neer had their teeth brushed in the first three years of its life wil have teeth like a twenty year old that has never seen a dentist. Not so good. So how do you brush a dog’s teeth? Just like you would brush a human’s, but you may have to get him/her used to it first. To do this, you can put a piece of gauze over your index finger and gently rub the gauze over the dog’s teeth. The dog may squirm and try to move away. Be firm. You’re in charge so stick with it at least until you get a couple of the teeth done. Work on this every day and the dog will get used to it and not fight it. Then you can work up to using a toothbrush and toothpaste. Use a toothpaste formulated for dogs, not people. The more you do it, the more your dog will accept it. It’s said that you should brush your dog’s teeth every day. Even if you do it once a week, you’re ahead of the game. How do you brush a cat’s teeth? My suggestion is take him/her to the vet for a sedated teeth cleaning. I don’t know about you, but I’m not brave enough to attempt brushing a cat’s teeth. Happy is a small mix that lives up to her name. She likes people and dogs alike. 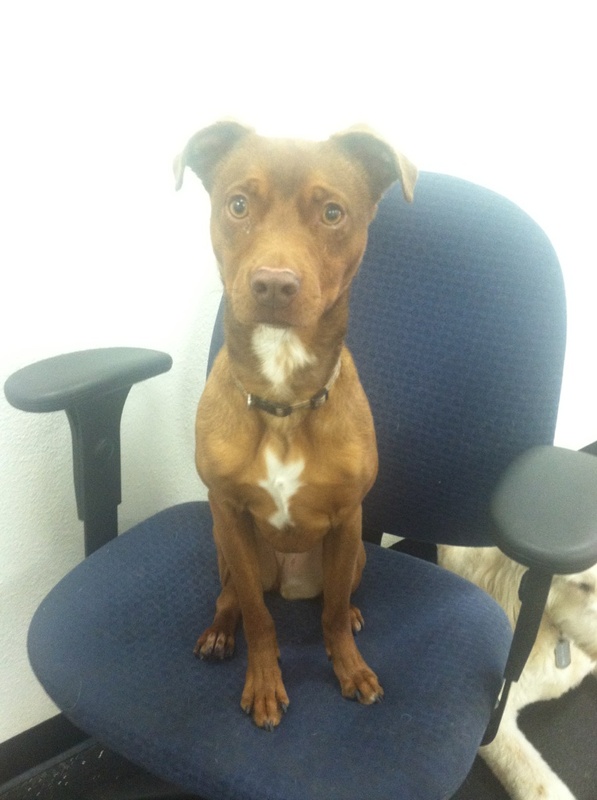 Happy is happy to cuddle with her human friends and then go off and play with her canine friends. Happy’s good friends are Baylee the Australian Shepherd, Finnigan the Greyhound, and Hampton the Boston Terrier. If you like to gamble than you know that a jackpot is a highly desirable thing. It works for dogs too. In dog training a jackpot is multiple, high value treats (like hot dog or cheese pieces) for an excellent performance. For example, if you ask your dog to come to you and he/she does it wihout hesitation and quickly, you could jackpot his/her reward. When you do this only for superb responses, the dog comes to understand that the reward is greater. This is a great way to turn a mediocre response into a fabulous one. As always, if you have any questions feel free to call us at 760-739-7299. Valentine’s Day is on its way and hearts are everywhere. Why not on your dog too? 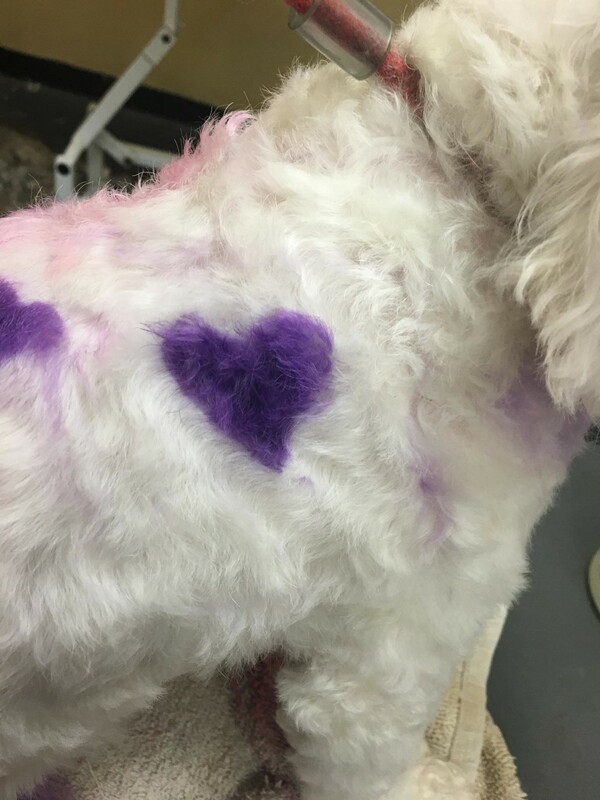 For the month of February, we’re offering pink, red, and/or white hearts colored on your dog for $5.00. You tell us what color and where and we’ll get it done.